For their Mobile Movement campaign, AT&T and Vice wanted to highlight the myriad ways in which mobile devices are enabling Millenials’ creativity. Their campaign was focused on real stories about people all over the U.S.
For South by Southwest, AT&T wanted to bring apps off phone screens and into their pop-up concert venue across the street from the Austin convention center. They wanted to create a mobile app experience that the crowds at South by Southwest could enjoy together, face to face. We worked with Keezy on their iPhone based music sampler of the same name. 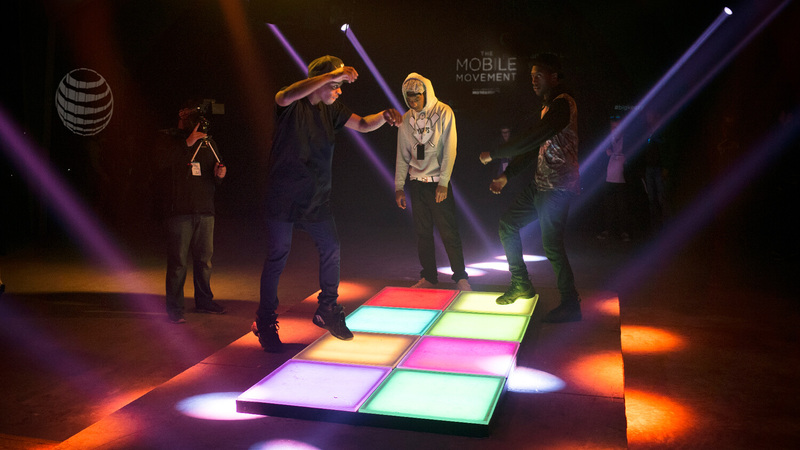 The aptly named Big Keezy turned the functionality of the original Keezy app into a live dance floor that gave performers and visitors an interactive sound stage like no other. In the same way that the app allows users to record up to eight sounds and play them back to create music, our life-sized interactive audio sampler featured eight colored pads on the floor that sounded notes when stepped upon. The Big Keezy’s simple interface and life-sized scale encouraged enthusiastic participation and spontaneous collaboration. Embodying SXSW’s spirit of discovery and experimentation, Big Keezy turned musicians including Reggie Watts into dancers, and dancers like Lil Buck into musicians. In addition to the social sharing during the event, videos of stars performing on Big Keezy became a part of AT&Ts Mobile Movement campaign.